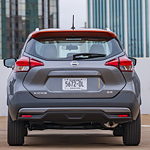 The new Nissan Kicks, a popular subcompact SUV, offers some pretty big features, especially if you’re into technology. The Nissan Kicks keeps with Nissan’s tradition of making vehicles that are economical and stylish while still providing great performance. Our staff at The Razzari Auto Centers is here to assist you in choosing your next vehicle. Technology can be seen throughout the Nissan Kicks, starting with the Automatic Climate Control, which allows you to set the perfect temperature and know that it will stay there and keep you comfortable. Regardless of how cold it is outdoors, the heated front seats and outside mirrors will ensure you’ll always be toasty warm and will have no worries about snow or ice blocking your view in the mirror. We have several models of the Nissan Kicks at our Nissan dealership and would love to invite you to take one out for a test drive.